It's no secret that many dogs love to chase cats, birds, and even mailmen. But this Spring Spaniel, Rocco, has a particular fondness for chasing after squirrels, and when he can't get to them he expresses his frustration in a ... unique way. 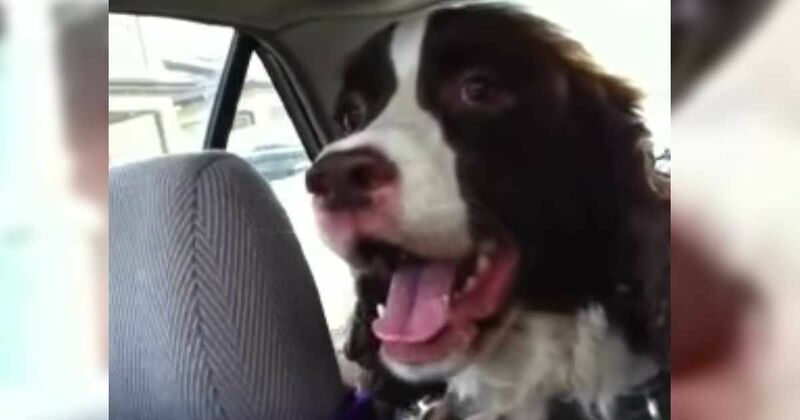 Meaghan Griffin shared this video of Rocco "singing" at a squirrel he can see but can't get to because he's inside the car with his owners. The high-pitched squealing sounds almost like a bird caller and his owners can't help but laugh at the excited dog. Rocco sings this tune often enough that Griffin affectionately refers to it as "the squirrel song," according to Griffin's video. The Spring Spaniel is a descendant of early English spaniels. Owners bred these dogs for hunting purposes in the 1800s. These energetic dogs are generally friendly and need room to play. The breed loves running around and is often very vocal, according to the Joyful Springer. This breed was famous as a hunting dog for a reason. With lots of energy and an adventurous spirit, these pups are great companions on long walks, hunting trips and play dates in the park, according to the American Kennel Club. Rocco certainly embodies the characteristics of the spaniel breed with plenty of excitement and a vocal personality.